HOSPITALITY EVENING: We are going to have an evening of hospitality on this Sunday evening, March 31st. We will meet in the Sanctuary from 5:30pm-7:00pm. This is the second of our three-part hospitality evenings. Theme: Hospitality: Community and Communication. Childcare: Childcare will not be provided at the church. If you want childcare please use Kids Cash to cover your childcare costs. Children are welcome to attend. GABC WOMEN: Join us and invite your friends to a “Mom’s Night Out” on April 12th. Doors will open at 7:00 p.m. and the event will start at 7:30. Laura Wifler and Emily Jensen of the Risen Motherhood podcast will answer the question, “How do I know if I’m a good mom?” The evening will also include dessert from The Cafe, table discussion, and a Q&A panel of local moms. A suggested donation of $10 is encouraged. For more information and to register visit gabcames.org/women. At the Welcome Center, you will find invitations to share with your friends, neighbors, or coworkers. If you would like to help with the event, please contact Amanda Philgreen or email gabcwomen@gabcames.org. MEMBERSHIP CLASS: Interested in becoming a Member of GABC? A Foundations of Membership Class is scheduled for April 28, from 1-4 pm in Room 102. This class covers our faith and practice. It is open to anyone wishing to learn more about life at GABC. Register at gabcames.org/membership or contact our church office (info@gabcames.org). 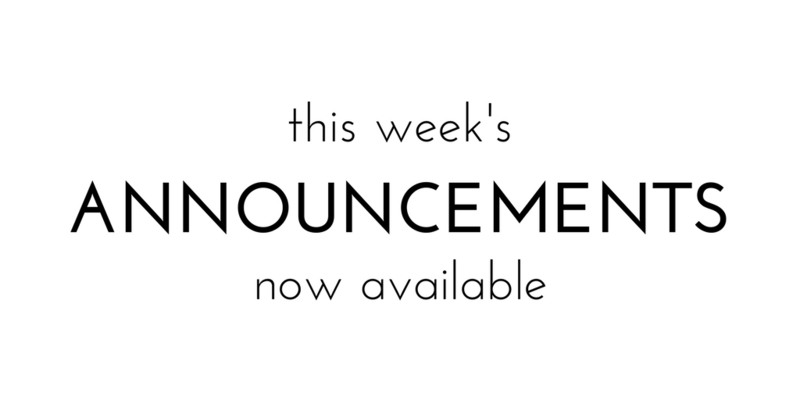 The announcements for this week are now available online.